Ask Learners to Prove They’re Learning! If you’re like most e-learning designers, you’re always keen to explore new ways to deliver engaging and meaningful projects. The question is: what changes in your course will make the biggest impact on the learner? Scenarios, interactivity, visual design? I say, the time’s right to liven up your course’s e-learning wallflower: the Next button! To engage learners with meaningful interactions, you need a cognitive approach that involves learners and guarantees attention on any course topic. It has to reinforce learning while eliminating multitasking and tuning out. One of the best ways to reinforce content is through repetition. Yes, repetition! And one of the easiest ways to build repetition into your courses is to mimic the CAPTCHA concept from the web marketing playbook: replace your Next button with NEXTCHA. Wait, what’s the CAPTCHA concept? Web sites use CAPTCHAs to prove a user is human. NEXTCHAs are the e-learning equivalent that asks course-takers to prove they’re learning. Why prove it? Studies show that learners actively engaged in an activity are ten times more likely to remember it. So NEXTCHA is the learning gatekeeper: you don’t learn, you don’t proceed. It works like this: just as CAPTCHAs ask browsers to decipher a droopy, algebra-looking phrase or equation to prove they’re human, NEXTCHAs ask learners to summarize a slide’s key concepts before continuing their lesson. Is it really enough to make a difference? Well, consider this: your typical 30-minute course has 30 slides and 30 Next buttons. 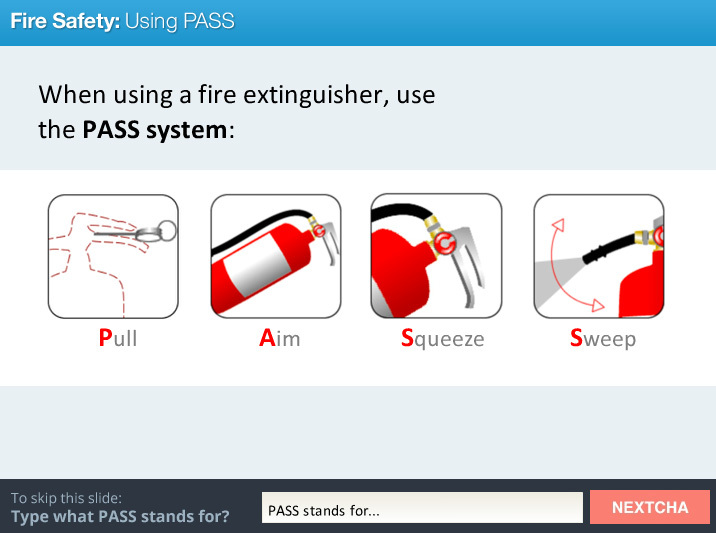 You can have your learners click 30 mindless Next buttons or practice 30 concepts. Proving one concept per minute of your course? Now we’re learning! The most popular NEXTCHA is auto-enabled when the slide concludes. Learners are asked to summarize the slide with a word or phrase from the slide. If learners are unable to summarize the slide, they’re asked to repeat the slide a second time. The pre-roll NEXTCHA is a variation on the post-roll that gives learners a choice: watch the slide play out in full, or type in a summary statement of that slide’s content. It’s like a pre-test at the slide level. It’s a progressive model that offers learners the option to view the 1-3 minute slide content, or let them prove—and practice—the key message by typing it into the NEXTCHA field. It’s the learner’s choice. Either way, it’s a win-win for your learning team! Another clever option requires learners to give course feedback to progress to the next slide. This “survey” approach, popular among data-driven managers, yields revealing insights beyond the smile sheet. 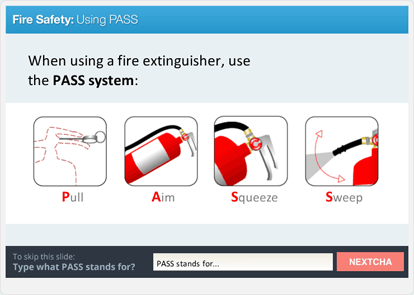 NEXTCHA, in effect, imprints key concepts on your learners through practice and repetition. So don’t put your hard-won e-learning content at risk with mindless click-throughs. Protect your online learning investment with a better Next button: NEXTCHA! 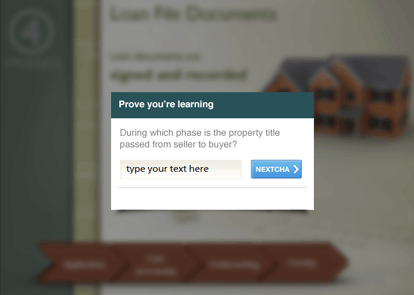 You can download some NEXTCHA templates for Articulate Storyline. We also posted a NEXTCHA elearning challenge in E-Learning Heroes. Check out the challenge for even more ideas for interactive text fields. Thanks for the intriguing idea! I can see this working as a way to reduce next buttons as well as reducing the “formal quiz” approach that’s common in most eLearning. Seems interesting. But can you please share where we can get these “Nextcha”s or how to create them? Hi Sreekanth – I’ll post the sample files in the Elearning Heroes community sometime tomorrow. It may have been originally meant as a joke, but I kinda like this idea (although wouldn’t use it on *every* page, I think)! Did you ever post the sample files? I can’t seem to find them (but I’m also not sure I’m looking in the right place)…can you provide a link? I thought this was April Fools but then realized it doesn’t matter: this is a GREAT idea either way. How did you create the examples? I’m really curious to see how you put the effect together. Glad you caught that, Clive. I thought it was a fun idea with (some) merit. If nothing else, it works as a speed bump for the next button. Great thought, David! Just one warning – this may turn out to be an overkill, if implemented with simple level1/2 questions. Perhaps asking implementation/application questions (level 3 and higher) based on the same basic concepts will make it more interesting – even if the answers are open ended and not completely right or wrong. After all, it is not meant to be a knowledge-check mechanism – learners just need to prove that they are following through! What say? Totally agree, Anu. I like your idea of using something like this for open-ended questions especially for post-course discussion. I hope to play around with it a little more and see where it best fits. Interesting idea but requires real innovative mind to implement it. One has to be sure of the content intervention, content complexity and training needs for sure. You’re totally right, Anurag. I see it ultimately as another way to vary the course pacing. It’s probably most effective when it’s least expected. Its not a learning test. Its a short term memory test. Who says what it has to be used for? Get creative. That is a nifty way of keeping readers/e-learners “on their toes”. At the same time, as various research has shown, tasks or chores (in learning too) should be broken down in chunks instead of being offered in lengthy stretches. This is a sensible way to group and at the same time provide closure to each sub-lesson.